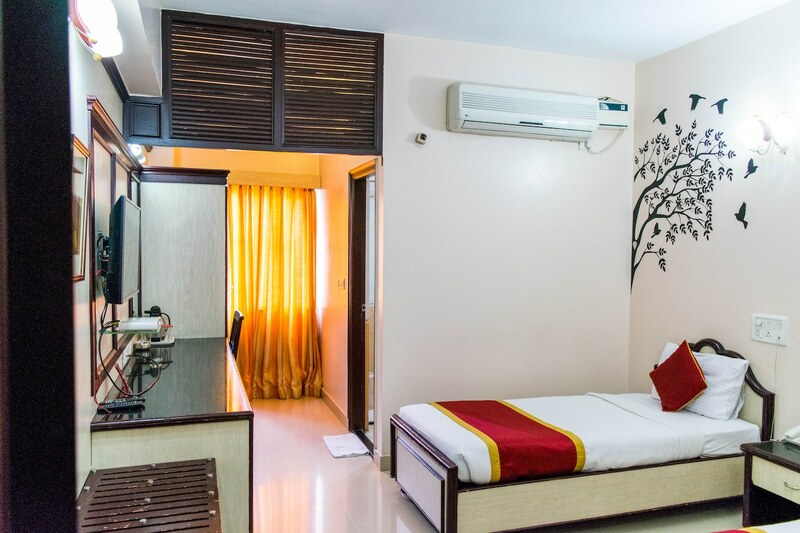 Located in Lalbagh in Bengaluru, Hotel Pai Vaibhav is an amazing hotel that provides countless facilities along with comfortable accommodation options. The rooms are very spacious and large windows make the space inviting. These windows allow a large amount of sunlight and a lot of fresh air into the room. The interior decor is of the minimalist nature and the walls have been painted in neutral hues along with some quirky patterns. The additional facilities provided by the hotel are free Wi-Fi, a constant power backup source, parking provisions, card payment facilities in all forms, and an elevator facility. The in-house facilities comprise a common dining room, a banquet hall, a conference room, and a common lounging area. The front desk service is located close to the entrance and is managed by experienced staff. The hotel is located close to a number of relaxation sources such as the Urvasi Theatre and MTR restaurant.